Although Moira and I have only met this boy briefly, I think we both know that he is going to be a DRC favourite. A medium sized fauve de Bretagne, Rusty is not at all scared of people, rather the reverse. Both Moira and I had our faces washed, in fact. At present Rusty is living inside, as he is painfully thin, but that is easily rectified. He is getting lots of love and care and we will make sure that continues after he leaves for his new life. 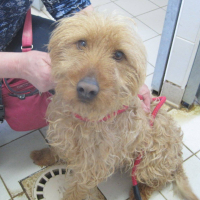 As Rusty has only just arrived we don’t know his date of birth yet, but watch this space, or get in touch! Kyklos is another DRC favourite. He is a russet-brown coloured lab cross who was born in April 2018, so he is yet another “not-quite-pup” who finds himself at the SCPA, and for the life of me I cannot understand why. He is exuberant, but no more than you would expect of a dog of this age. He is perfectly well socialised, and was happy to share his box as soon as he left the pound. He is at that lovely play-fighting stage with other dogs, but knows exactly when to stop, so he has what we call the “codes!. Kyklos is a really great lad. Let’s get him out very soon! Cortex is one of two big and handsome cross breeds who arrived at the refuge having been found straying in a nearby village. They were eight months old at the time, and we suspect that they just grew bigger than expected. However lots of people like big dogs, especially white fluffy ones! 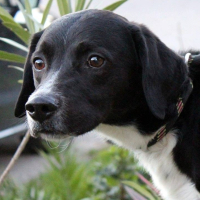 These dogs would love to find homes, and the sooner the better! 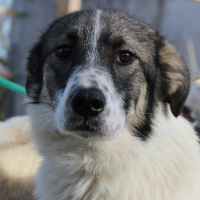 Minus arrived with his brother Cortex, both dogs having been found straying in a local village. They were born in April 2018, so it is probable that these pups just got too big and were dumped. They are great lads, both of them. Stunning cross breeds, probably Pyrenean mountain crosses, they are at their full height now, but with some more filling out to do. They have lots of learning to do, but are good natured and handsome dogs who will be great family members. 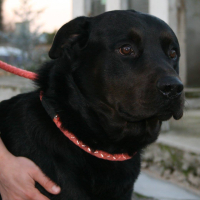 Black was brought to the ScPA for rehoming due to the death of his owner. He is a big lad, and no one in the family was able or willing to take him in. This is incredibly sad for the dog, of course, as he has lost his master and with it his home. He is having to do his grieving from behind bars. Black is officially a labrador cross, but he looks like a big all black rottweiler. Extremely gentle, luckily, as he looks quite imposing at first. Black was born in May 2015, so is in the prime of life. We would love to find him a new home, he has been a loyal companion thus far and his arrival at the ScPA is just bad luck. 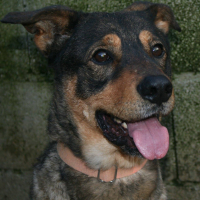 Jaffa is an amazing dog who has just had bad luck. He was adopted from the SPA when he was a puppy, and brought back when his owners bought a pedigree dog. Incredible, isn’t it? But yes, some people are that shallow. While back at the refuge Jaffa showed just how perfect he was, and he was soon adopted. Unfortunately his new owner brought him back as she says he pulls too much on the lead. What a shame she did not realise this before offering him a home. Jaffa is fine with other dogs, he just wants to say hello to everyone he meets. He is a shepherd cross who was born in September 2014. 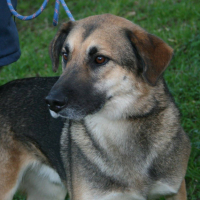 He is fine with other dogs, is fine with children and can be left alone with no difficulties. So a perfect dog. I think we have another hidden gem here, guys! Six year old Banksie arrived at the refuge on Boxing day morning and we hope that doesn’t mean what we think it might mean. Perhaps he genuinely is lost, although we realise that the chances of him being reclaimed are slim. 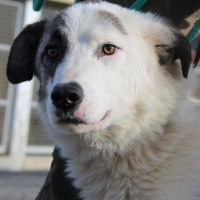 He is a lovely chap, we are pretty sure he is a border collie cross, and although clearly frustrated at being locked up, he is friendly and smiley. 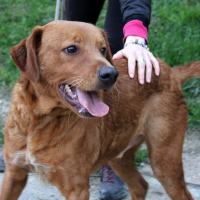 As soon as he comes out of the pound we will have him mixed with other dogs, as he seems to be extremely sociable, and will let you know what he is like on the lead. In the meantime, if you have any questions about this lovely boy, feel free to ask. Oups is a very chunky young lad. 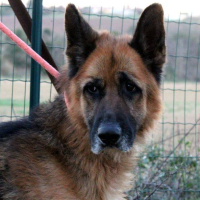 He was brought to the refuge by a woman who had been trying to do good, but as is so often the case, had become overwhelmed by the number of dogs she wanted to save, none of whom was adoptable due to the fact that they lived as a pack, with no walks or socialisation. Luckily Oups is young enough to have his life turned around, which is what the ScPA is now attempting to do. At present Oups pulls on the lead and we are not able to get him to share his kennel, but both of these are just a matter of time. And when you see how handsome Oups is, you realise why we are posting him! 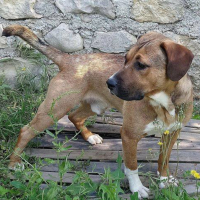 A boxer malinois cross, Oups is a stunning mix. He was born in July 2017 and is castrated, vaccinated and identified.